Hardwood plywood panel is made from layers of wood veneer or veneer in combination with lumber core, particleboard core, MDF core, or hardboard core. Shelves, cabinets, and displays made from hardwood plywood are a great choice for individuals that want an efficient and environmentally-friendly material. It also has a beautiful grain and appearance. 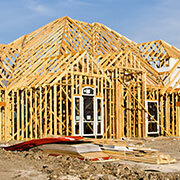 Hardwood plywood is strong and durable, so it will last for years. Our hardwood plywood comes from Columbia Forest Products, the largest manufacturer in North America, so you will be sure to find the right option for your design. Wood from China, Russia, Indonesia, and Malaysia are commonly referred to as imported plywood products. This material offers similar characteristics to hardwood plywood but comes in a limited number of species and grades. Imported plywood typically costs less than domestic hardwood plywood, but provides comparable quality. 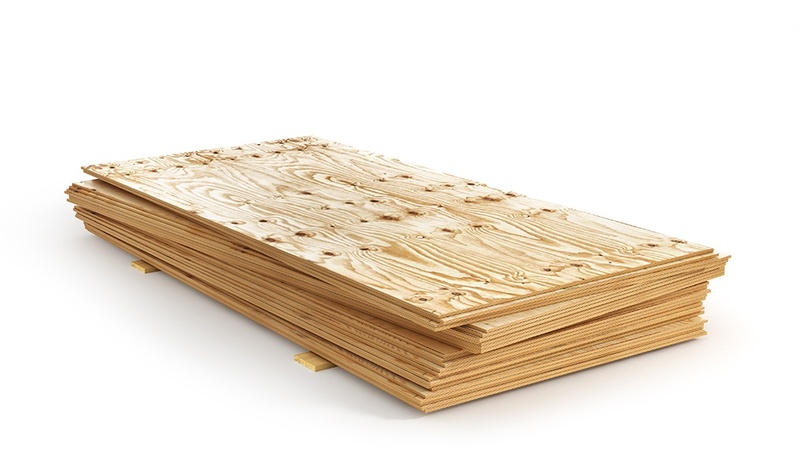 Imported plywood may be perfect for shelving, furniture, and other interior projects and applications. We provide products from a number leading importers. Both plywood and particleboard are great products for a number of interior uses. When it comes to creating a workstation or display, plywood and particleboard are a great option for creating shelving, furniture, or interior cladding. Different grades are available to meet your desired appearance and quality threshold. These manufactured woods are fairly strong and inexpensive but are weighted more for aesthetic purposes versus durability. Our products from both Roseburg and Arauco can be used to create the perfect indoor shelving, retail display, or furniture piece to meet your project's specifications. Laminate panels are made by using heat to fuse a melamine plastic sheet of décor paper to particleboard or MDF. 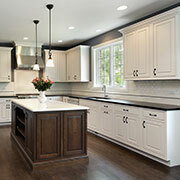 It is often used to create cabinets, shelving, and other interior furniture. Using TFL is like using plywood or particleboard to create your workstation or retail shelving; however, these panels offer far more style options. Leverage these TFL to create a modern look that cannot be achieved by using only manufactured wood. Amerhart carries TFL from top brands Arauco, Panolam, and Roseburg, all of which offer products with superior performance, function, and design. Standard laminate panels can help you create the shelving and furniture you need for a variety of applications, but there are also custom laminated panel products for that unique, one-of-a-kind project. A popular custom laminate panel product for both residential and commercial projects is Slatwall. Slatwall panels are rectangular pieces of MDF with an optional coat of colored laminate that have horizontal grooves to accept hooks, baskets, or shelves. 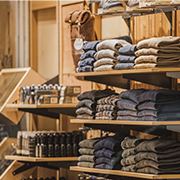 The introduction of Slatwall panels into space provides the perfect system to easily display and organize personal goods or retail products. Amerhart offers custom laminate solutions from Wind Mill Slatwall Products. Wind Mill produces both standard and custom Slatwall panels from ultra-strength Anchor Core or MDF panels. Their products are available in a variety of standard finish options including paint grade, ready to finish, or laminates with a durable finish. Edgebanding or wood veneer is added to the edges of plywood paneling to hide the manufactured wood ends and create a finished look. Adding edgebanding to panel products is a cost-effective way to achieve the more contemporary look offered by more expensive stone and solid surface materials. The edgebanding options Amehart offers from REHAU and SR Wood make it easy for you to find the appropriate product for any project. Standards are long, square metal rods that are screwed vertically to a wall. They have many holes in the front that are designed to hold shelf brackets. At least two standards and two brackets are needed to create a sturdy shelf system. Standards typically have many holes, so multiple shelves can be created per one set of standards. The shelves can also be adjusted on standards by moving them up or down holes. Brackets typically have a triangular or L-shape depending on the product. The triangular brackets insert into the standards and have a flat top designed to hold a shelf panel. The L-shaped brackets can be screwed directly to the wall, but are not as easily relocated and changed as brackets in standards. Amerhart offers standards and shelf brackets from Knape & Vogt that come in a variety of sizes and finishes for any home, industrial, or commercial need. There are also wide varieties of accessories separate from standards and brackets that assist in building the perfect display or storage area. Some of these items include shelf supports, closet rods, and pilaster clips. 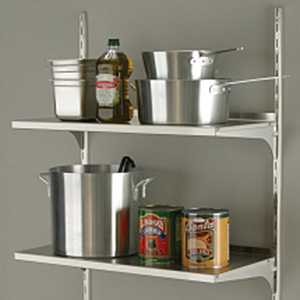 A shelf support is a metal or plastic fastener that holds a shelf between two panels. They are different from L-shaped brackets as they are typically used in cabinets or closets instead of directly attaching to the wall. A pilaster clip provides the same function as a shelf support, but clips directly into a pilaster that is attached to a panel. Closet rods are another display or organization accessory that can be used to hang items or products neatly in a cabinet or closet. Amerhart offers an extensive selection of cabinet shelf supports, wardrobe shelf supports, shelf pins, pilaster clips, closet rods, and more from many trusted brands. Accessories like furniture, cabinet, and equipment legs add the finishing touch to newly built furniture or improve the appearance and function of older pieces. Whether working on chairs, cabinets, bookcases, or tables, we carry a wide variety of furniture legs in different heights and materials to meet your projects needs. Amerhart offers legs from major manufacturers like Peter Meier that have versatile products for residential, office, and industrial or commercial furnishing uses. Peter Meier also offers products like table bases that can assist in the creation of custom coffee tables, islands, bars, and more. 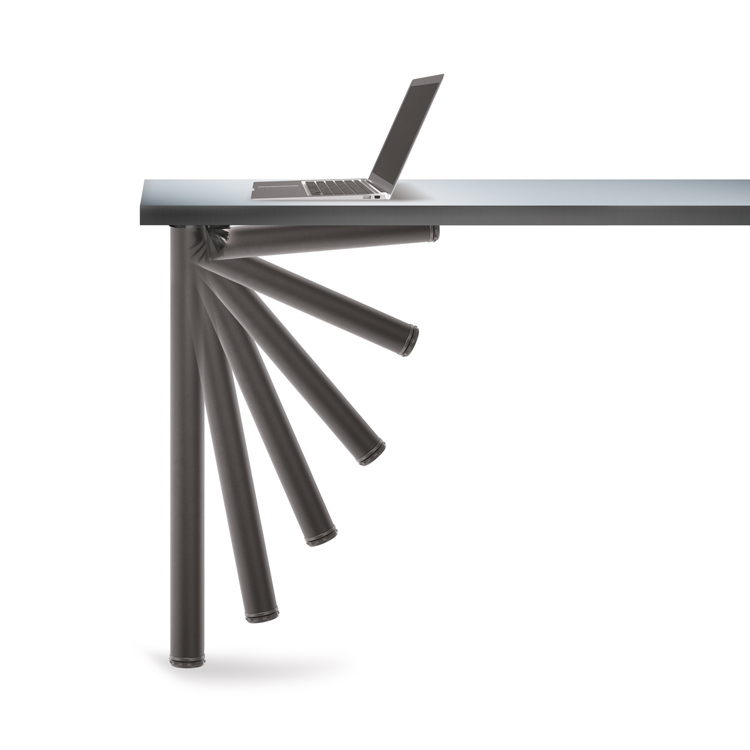 Table accessories such as adjustable height workstations may also be a great addition to many workspaces. These workstations allow the option to sit or stand, which provides an easily adaptable work environment to meet individual needs. In order to construct and assemble furniture it is necessary to use the proper fasteners. Wood screws, cabinet screws, and hardware screws are commonly purchased during shelf and display construction. Quickscrews offers high-quality woodworking screws for cabinet and furniture assembly. Their products guarantee a sturdy hold, easy installation, and an attractive look. Classic yellow or white glue is a popular adhesive used for woodworking. The Franklin Titebond brand offers a variety of wood glue options that can be used to repair or construct fencing to furniture. Sometimes you don't always know what type of adhesive you will need on the job. If this situation arises, it is always a good idea to keep all-purpose glue handy. The FastCap 2P10 adhesive system is an industrial strength glue option for use on wood, plastic, glass, metal, and most other surfaces. The 2P10 system consists of an aerosol activator and one of four squeeze bottle glue types "Jel," "Thin," "Medium," and "Thick." Each of these different adhesives has a specialized use. The "Jel" is an all-purpose option that is great for trim carpentry, filling large gaps and vertical surfaces. "Thin" will solidify decayed material and is designed to fill hairline cracks. For smooth surfaces like laminate or melamine, "Medium" works best. Use "Thick" when binding joints or filling holes on porous surfaces like particleboard. FastCap also offers a product called SpeedTape, which is a peel and stick roll of ultra-bond adhesive. It can be used to easily attach edgebanding, laminates, jigs, and templates or to reattach furniture trim, carpet, wallpaper seams, and more. Products with multiple uses like these can truly work wonders when you are on the job site and in need of a quick adhesive solution. Attaching edgebanding to the edges of wood panels to create a finished look is done using hot melt. Hot melt, also known as hot glue, is a thermoplastic adhesive that is solid at room temperature and softened to a liquid by using heat. We recommend using REHAU RAUBOND hot melt to apply our bestselling REHAU brand edgebanding. Another option would be Dorus hot melt, which is a similar product and can be used on PVC, thick PVC, Veneer, Melamine, Laminate, Polyester, and ABS. When using hot melt or hot glue adhesive when remodeling or making repairs it may be ideal to have a glue gun applicator. 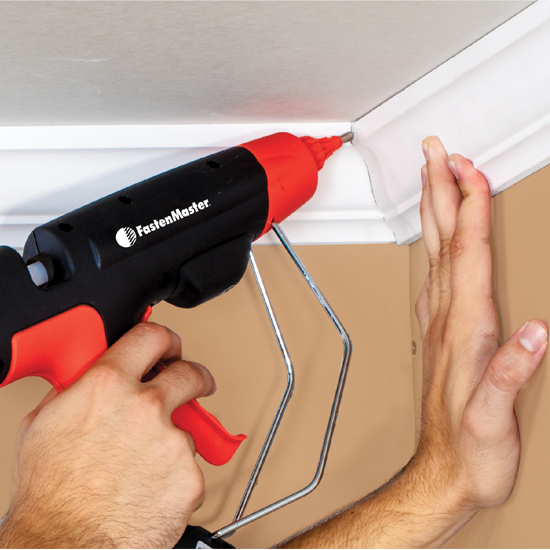 FastenMaster offers the HB220, a professional grade adhesive system that isn't your typical glue gun. The HB220 has an adjustable high-temperature range of 285°F – 428°F (140°C – 220°C) and a powerful 220 Watt heating element for heavy all day usage. This glue gun is designed for use on hardwood flooring, carpet tack strip, interior wood trim, moldings, and more. An abrasive is a sanding material, usually made of mineral, that is used to shape or finish a piece of work. The rubbing and friction can grind, polish, or clean the surface of an item by wearing away the layers. Abrasives are perfect for automotive refinishing, painting, decoration, wood processing, marine industry, home use, and do-it-yourself projects. Mirka offers abrasive sponges, pads, and discs that can be used on a variety of materials, such as aluminum, copper alloys, brass, bronze, hardwoods, softwoods, veneers, manufactured wood, lacquers, paint, primer, plastic, plaster, and more. For industrial or high-volume uses Mirka also offers a range of power sanders, orbital sanders, finishing sanders, and polishers. Working with wood, metal, and other solid surface materials to produce fixtures, displays, or workstations that meet a project specification requires flexibility, ingenuity, and attention to detail. To create all of the joins, grooves, and profiles needed it's important to have access to a diverse set of high-quality drill and router bits. This is where Amana Tool shines. 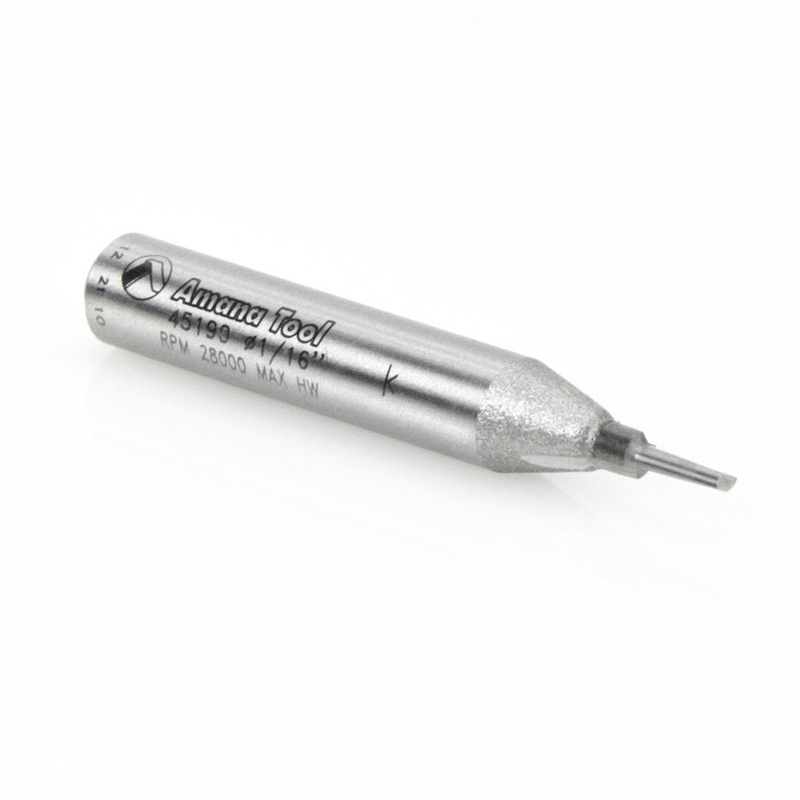 Amana Tool specializes in the production of industrial quality solid carbide, insert carbide, and carbide-tipped cutting tools for the woodworking, plastics, aluminum, composite, and metal industries. Their full line of cutting tools includes saw blades, router bits, shaper cutters, and boring bits, providing you with an unmatched assortment to meet all of your application needs. Please contact us to learn more or discuss your application specific needs.